Vitamin C is consumed in a supplemental form by millions of people across the world for its antioxidant properties which are well-documented in medical research. 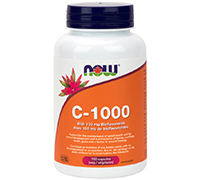 NOW Vitamin C-1000 provides a potent dosage of this key vitamin and is blended with Bioflavonoids, natural synergists to Vitamin C. From the FDA's website: "Some scientific evidence suggests that consumption of antioxidant vitamins may reduce the risk of certain forms of cancer. However, FDA has determined that this evidence is limited and not conclusive."